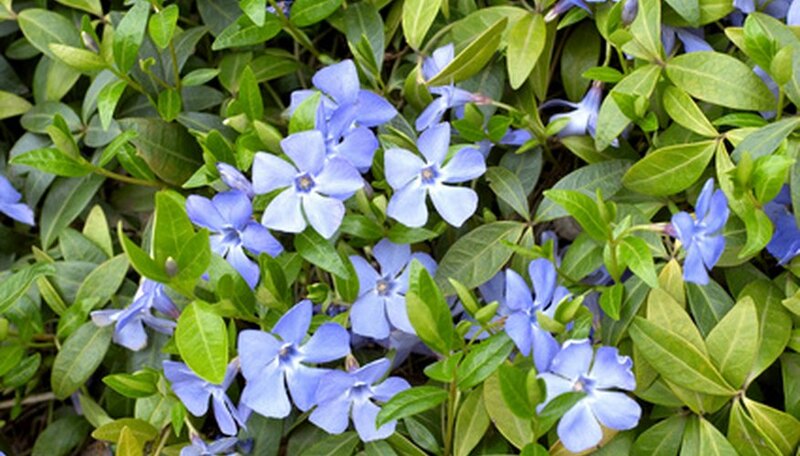 Vinca minor, with its glossy blue-green leaves and lilac blue flowers, is an excellent ground cover for shady areas. This member of the dogbane family is evergreen, no more than 6 inches in height and fast growing. Vinca minor forms thick mats with trailing stems that will root along their path. The plant comes in more than a dozen varieties, including ones with darker purple flowers or variegated leaves. It's a tough plant and easy to grow, but there are some diseases that can be a threat. Stem blight is a widespread and potentially fatal disease caused by a fungus (Phoma exigua var. exigua), which persists indefinitely in plant debris and moist soil. Symptoms include quick-growing, dark brown or black lesions that girdle stems at the ground, causing dieback. The lesions may extend over the entire stem in only a few days. Dark spots may appear on leaves, causing them to brown, wither and drop. The plant may die within two or three weeks. To avoid stem blight, the University of Illinois Extension recommends buying only disease-free stock from a reputable nursery; watering your plants only enough to maintain vigor; and mulching newly planted beds with black plastic covered with pea gravel. Diseased beds should be replaced with a different ground cover. Botrytis blight (Botrytis cinerea) appears during wet weather as brown or black spots on vinca minor's leaves. The spots extend inward from leaf edges and may grow as large as the entire leaf. To foil botrytis blight, remove blighted flowers, leaves or entire plants only in dry weather to avoid spreading the spores. Dispose of infected pieces by putting them in the trash or burning. Do not compost. Crowding, watering overhead or misting your plants can encourage botrytis blight. If the fungus becomes overwhelming, apply a fungicide that contains chlorothalonil, potassium bicarbonate, neem oil or Bacillus subitlis. The fungus Phomopsis livella can cause vinca canker. Tips of shoots on affected plants will become dark brown and die back to the ground. Stems will turn nearly black with tiny black dots. This fungus occurs during constantly moist to wet periods. Use a copper fungicide as a preventive spray on new growth in the spring.